With the new slot-in gaming platform series with backplane architecture, it is now much easier to handle the complexity of the peripherals, as well as maintenance and upgrade. 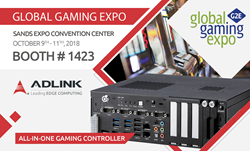 ADLINK Technology, a global provider of leading edge computing solutions across industries and a NVIDIA Preferred Partner, will showcase its latest embedded solutions for professional gaming in Booth 1423 at Global Gaming Expo (G2E) from October 9 – 11 at the Sands Expo and Convention Center in Las Vegas, NV. “In this professional gaming market, gaming OEMs and machine manufacturers strive to provide a unique gaming experience and therefore require a solution that provides flexible and scalable system configurations with a high level of reliability and serviceability within a given budget” said Oliver Merfels, Director Infotainment of ADLINK. "We are excited to show our new line of gaming solutions that address those challenges.” Merfels commented. “With the new slot-in gaming platform series with backplane architecture, it is now much easier to handle the complexity of the peripherals, as well as maintenance and upgrade.” ADLINK will showcase the new ADi-SC platform which is an all-in-one embedded slot-in system with backplane architecture, integrating socket-type Intel® embedded processors and optional NVIDIA® graphics for high-performance multi monitor applications. For more information on G2E, please visit http://www.globalgamingexpo.com/. For more information on ADLINK’s application-ready intelligent platform and embedded solutions, please visit ADLINK’s website at https://www.adlinktech.com/en/Infotainment.aspx. ADLINK Technology is a global leader in Edge Computing. Our mission is to facilitate the use of advanced technologies to help optimize the business performance of our customers. We provide robust boards, platforms and user interfaces; real-time data connectivity solutions; and application enablement for state-of-the-art industrial computing (e.g., machine learning via AI-at-the-Edge). Together, these also enable innovative end-to-end IoT solutions in support of operational excellence or new revenue streams. ADLINK serves customers in many vertical markets including: manufacturing, networking and communications, healthcare, gaming and infotainment, retail, energy, transportation, and government and defense. ADLINK has an excellent eco-system of technology partners; we are a Premier Member of the Intel® Internet of Things Solutions Alliance, a strategic embedded partner of NVIDIA, and a valued thought-leader and contributor in many standards and interoperability initiatives, including AGEM(The Association of Gaming Equipment Manufacturers) and GSA(Gaming Standards Association). ADLINK’s products are available in over 40 countries, either directly or through our worldwide network of value-adding distributors and systems integrators. ADLINK is ISO-9001, ISO-14001, ISO-13485 and TL9000 certified and is publicly-traded on TAIEX (Stock Code: 6166).